RAFT writing requires that stu dents become a person, place, thing or idea and write from that perspective. They ARE Cinderella, a cell, Santa Claus, a beach, the galaxy, an ordinal number, etc. 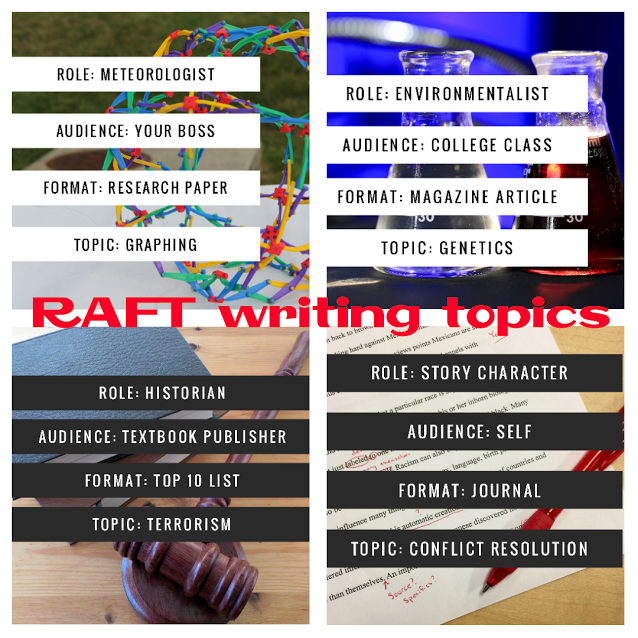 RAFT writing can be used to describe a chemical reaction, explain the process of condensation, describe a point of view, envision a potential plan of attack, or solve a problem. It can be creative and informative. 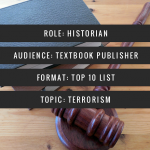 ⇒Step 1: Once your content has been covered, consider all of the various roles and audiences that would allow students to demonstrate their new understandings from different perspectives. 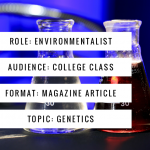 Conduct a class brainstorming session to gather numerous possible perspectives on your topic. 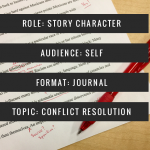 R = Role role of the writer. What persona are you adapting? You might be a person, place, thing, or idea. In developing the final product, what role will the students need to “take on”? Who are you as the writer? Are you President Trump? A warrior? A homeless person? An auto mechanic? The endangered snail darter? A = Audience. The who or what the RAFT is being written for. Who should the students consider as the audience for the product? To whom are you writing? Is your audience the Canadian people? An enemy? Your teacher? 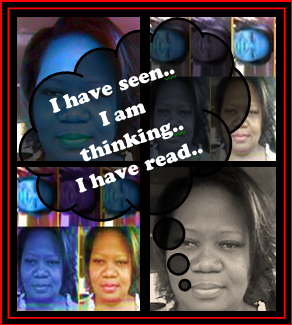 Readers of a newspaper? A local restaurant? F = Form The form the writing will take, as in letter, song, meme, image, movie, diary, etc. What form will the writing take? What is the best product that will demonstrate the students’ in-depth understanding of their interactions with the text? A writing task? Art work? Action plan? Project? A letter? A classified ad? A speech? A poem? T = Topic This is the what that will be the focus/subject of the final product. What are you writing about? What’s the subject or the point of this piece? What event will constitute the centerpiece of the action? To explain bloodflow? To persuade a gangster to spare your life? To plead for a re-test? To call for stricter regulations on logging? A list of characteristics? 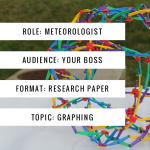 ⇒Step 3: Give students a RAFTed assignment. 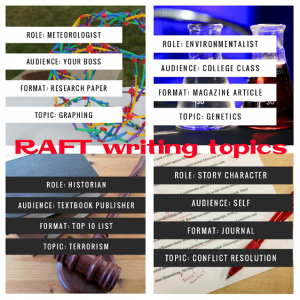 RAFTs can be directed or left open to students to choose. Initially, it is best to assign students to complete specific RAFTs. As they gain more experience and familiarity with the writing strategy, they can be allowed more freedom. F – A newspaper article, a letter, a diary entry, dialog, etc. ⇒Step 4: Students complete RAFTs individually or with partners. Allow them to do pair shares to insure that they are on the right track. 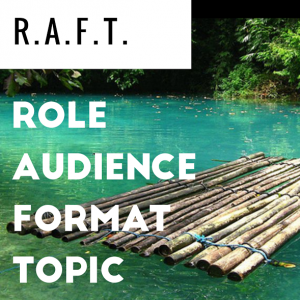 ⇒Step 5: Students share their RAFTs with the class. Other students should listen for accuracy and logic. An accurate RAFT response will accurately reflect the views and perspective of their character. When creating RAFT assignments, be sure to incorporate a variety of interesting responses. The form can be a photo album, letter of introduction, job resume, photostory, meme, gif, etc.The goal is for them to respond and demonstrate that they have mastered the content. Here are some examples of what RAFT writing assignments would look the classroom. I hope that you have a great time RAFTing with your students. Posted on December 4, 2016 by Ms. B.. This entry was posted in Blogging, Web and Wiki Tools. Bookmark the permalink.